On the 7th (Fri), contemplate in the serene atmosphere at Wat Pho, step into the grandiose world of The Grand Palace, then look for gifts at Vicky's Fashion, and finally explore the world behind art at Bangkok Art & Culture Centre (BACC). Get ready for a full day of sightseeing on the next day: contemplate in the serene atmosphere at Temple of Dawn (Wat Arun), then admire the landmark architecture of Jim Thompson House, and then stop by Chatuchak Weekend Market. To find other places to visit, reviews, ratings, and tourist information, read Bangkok trip itinerary maker. If you are flying in from Pakistan, the closest major airports are Don Mueang International Airport and Suvarnabhumi Airport. In October in Bangkok, expect temperatures between 38°C during the day and 30°C at night. Finish your sightseeing early on the 8th (Sat) so you can fly to Bophut. On the 9th (Sun), take a stroll through Fisherman’s Village, then see some colorful creatures with a scuba or snorkeling tour, then stroll through Chaweng Noi Beach, and finally stop by La Moda suits. To find photos, maps, other places to visit, and tourist information, use the Bophut travel itinerary creator. You can fly from Bangkok to Bophut in 3.5 hours. Alternatively, you can do a combination of car and car ferry; or do a combination of train and ferry. October in Bophut sees daily highs of 36°C and lows of 30°C at night. Finish your sightseeing early on the 9th (Sun) to allow enough time to ride a ferry to Ko Phangan. Start off your visit on the 10th (Mon): kick back and relax at Haad Yuan Beach and then see some colorful creatures with a scuba or snorkeling tour. To find traveler tips, photos, other places to visit, and more tourist information, go to the Ko Phangan itinerary maker. You can ride a ferry from Bophut to Ko Phangan in an hour. October in Ko Phangan sees daily highs of 36°C and lows of 30°C at night. Finish your sightseeing early on the 10th (Mon) to allow enough time to travel to Patong. On the 11th (Tue), take some stellar pictures from Karon View Point, get great views at Nai Harn Beach, then kick back and relax at Kata Beach, and finally enjoy the sand and surf at Kata Noi Beach. Get ready for a full day of sightseeing on the 12th (Wed): discover the deep blue sea with a scuba or snorkeling tour, then stop by Instyle Fashion, and then enjoy the sand and surf at Karon Beach. To find reviews, more things to do, and tourist information, use the Patong trip itinerary maker. Traveling by combination of flight and ferry from Ko Phangan to Patong takes 3.5 hours. Alternatively, you can do a combination of car and ferry; or do a combination of bus, train, and ferry. Plan for little chillier nights when traveling from Ko Phangan in October since evenings lows in Patong dip to 27°C. Wrap up your sightseeing on the 12th (Wed) early enough to travel to Ko Lanta. On the 13th (Thu), get reinvigorated at Oasis Yoga, then enjoy the sand and surf at Long Beach, and then discover the deep blue sea with a scuba or snorkeling tour. To find traveler tips, maps, more things to do, and tourist information, go to the Ko Lanta itinerary maker. Traveling by ferry from Patong to Ko Lanta takes 2.5 hours. October in Ko Lanta sees daily highs of 36°C and lows of 27°C at night. Finish your sightseeing early on the 13th (Thu) so you can travel to Ko Phi Phi Don. Start off your visit on the 14th (Fri): contemplate the waterfront views at Laem Tong Bay, then discover the deep blue sea with a scuba or snorkeling tour, and then make a trip to Koh Phi Phi Viewpoint. To find reviews, where to stay, more things to do, and tourist information, read Ko Phi Phi Don itinerary planner. Traveling by ferry from Ko Lanta to Ko Phi Phi Don takes 1.5 hours. In October, daytime highs in Ko Phi Phi Don are 36°C, while nighttime lows are 27°C. Cap off your sightseeing on the 14th (Fri) early enough to catch the ferry to Krabi Town. 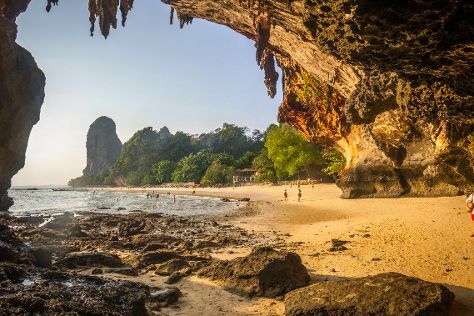 Kick off your visit on the 15th (Sat): stop by Krabi Exotic Decor, look for gifts at de' MARCO Fashions, then stroll through Railay Beach, and finally kick back and relax at Phra Nang Beach. To see more things to do, other places to visit, maps, and tourist information, read Krabi Town vacation trip planner. Getting from Ko Phi Phi Don to Krabi Town by ferry takes about 1.5 hours. In October in Krabi Town, expect temperatures between 36°C during the day and 27°C at night.